WBRC-6 is a Birmingham, Alabama television station and an affiliate of the Fox television network. In the 8am news bulletin on November 22, 2005 the station incorporated material from a satellite media tour (SMT) organized by D S Simon Productions for the Panasonic, Namco and Techno Source on high-tech gift ideas. The SMT was organized for Robin Raskin. 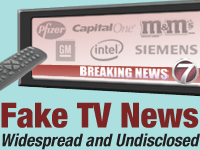 In response to the Center for Media and Democracy's (CMD) Fake TV News report, WBRC-6 news director Mike McClain took issue with CMD's assertion that the station "ran the live SMT without informing viewers that Raskin's appearance was funded by the makers of the very products she was praising" (the exact words used in the report). "I recently talked with Robin Raskin - the Internet Mom - thanks to several tech companies and here's what she had to offer to keep your kids safe and keep you sane!"